"It is the fate of every human being," Sacks writes, "to be a unique individual, to die his own death." How does one even begin to review this book? No matter what words I use to describe it, it still will not do it justice. 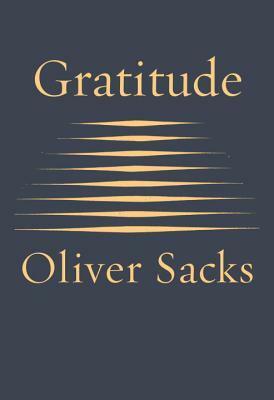 The four essays compiled in this collection were written in the last two years of Oliver Sack's life. The first of essays, Mercury, celebrates the joy of aging. In it Sack's includes, some minor regrets he had but mostly reflects on the enjoyment he's had in his own life and the pleasure of sharing experiences with those who have passed before him. "One has had a long experience of life, not only one's own life, but others' too." Mercury is followed by My Own Life. A brief retelling of the emotions and thoughts going through Sack's mind as his condition had worsened. The third essay, My Periodic Table relates to the treatment of his ailments. The fourth and final essay, Sabbath, he retells parts of his family life, upbringing and religious beliefs. Gratitude is a small book packed with a ton of emotion and food for thought. It's intriguing and uplifting to see inside the mind of someone who knows that the end is near. This is a book that I know I will cherish for many, many years. Disclaimer: I received a finished copy of Gratitude from Random House Canada. All opinions are my own.